When the bodyguard tries to intervene, he, too, is shot, leaving the killer free to shoot Voronenkov again as he is lying on the floor. MOSCOW: A senior Ukrainian official says the killer of Kremlin critic Denis Voronenkov, who was gunned down in the Ukrainian capital of Kiev, was a Russian agent. Anton Gerashchenko, an adviser to Ukraine's interior minister, identified the man who shot Voronenkov on Thursday as 28-year-old Pavel Parshov and said he had been trained in Russia by Russian security services. He was killed in the attack. "He underwent a special course at a school for saboteurs," Gerashchenko wrote Friday in a Facebook post. Dmitry Peskov, a spokesman for Russian President Vladimir Putin, told reporters that Gerashchenko's allegation was "absurd." 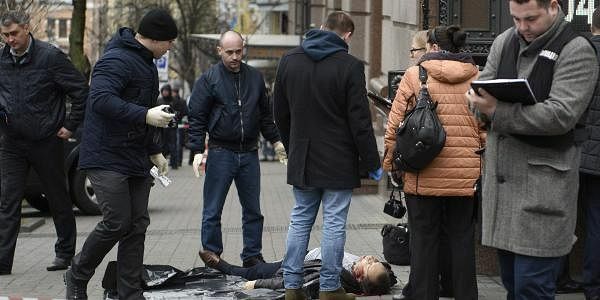 Voronenkov, a former Russian lawmaker who became a vociferous critic of Moscow following his recent move to Ukraine, was shot dead near the entrance to an upscale hotel in the center of Kiev. Ukraine's chief prosecutor, Yuriy Lutsenko, said Voronenkov was killed shortly before meeting with another fugitive Russian lawmaker, Ilya Ponomaryov. Both men were scheduled to give testimony later Thursday at Ukraine's Military Prosecutor's Office. The purpose of the testimony was not immediately clear. Ukrainian media on Friday published leaked CCTV footage of the attack. It shows the killer shooting Voronenkov from behind as he was walking down the street with his bodyguard. When the bodyguard tries to intervene, he, too, is shot, leaving the killer free to shoot Voronenkov again as he is lying on the floor. The injured bodyguard then pulls out his gun and, while lying on the floor, opens fire on the killer, who died later in the hospital. The slaying ignited an uproar between Moscow and Kiev, with Ukrainian President Petro Poroshenko immediately calling the killing an "act of state terrorism" by Russia. Russian officials angrily denied the charge, suggesting that Ukraine was organizing a cover-up.